Hippy heaven, an environmentally friendly place with great food. 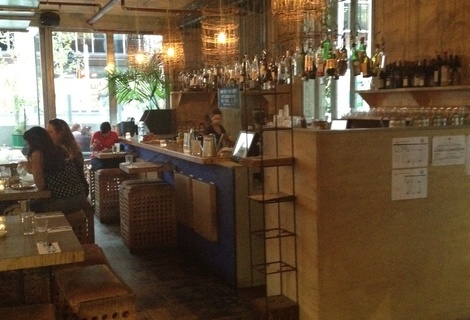 The Greenhouse was reviewed on Monday 23rd January 2012 18:30 by Richard. If you pulled up to the Greenhouse in your V8, strolled up to the door in your crocodile skin loafers and tried to check in your fur coat at the front door, every hippy in Perth would chase you down the Terrace with their recycled plywood pitchforks and any other type of weapon they could fashion from salvaged scrap metal. This place is hippy heaven, just about everything is sustainable or made from some type of recycled material. Don’t get me wrong, I love it, it gives the whole place a rustic, earthy vibe and gives you a warm fuzzy feeling that you are supporting a business that is doing its part to help our planet. The two of us managed to get one of the few remaining tables downstairs, the place was pretty packed for a Monday afternoon. I’ve been to the Greenhouse about three or four times before but this was the first time I’ve had a meal. After sitting down for a few minutes, I noticed that the chairs were pretty uncomfortable, more akin to sitting on a toilet seat than on a chair in a pub/restaurant, but like the rest of the place, they were also made from recycled materials. So I guess sacrificing a bit of comfort so that a few extra trees could live to see another day wasn’t all that bad. I had quite a small lunch that day so I was keen to order as soon as possible. At the beginning the service seemed to be really fast and efficient, we were given menus straight away and provided with table water (from an old aluminium watering can). We ordered two of the three beers available on tap as well as two mains to share. The waitress informed us that this was a share menu and when I originally ordered the wood roasted beef belly for myself I was warned that it was quite large and it may be wiser to share along with something smaller on the side. So we obliged and took the waitresses advice. I’m all for restaurant staff making recommendations but she was literally forcing us to make a decision, it was quite awkward and uncomfortable. Finally we settled on the squid with chili and coriander. The squid came out within 10 minutes of ordering (in an old sardine tin), it had great flavors and was cooked really well (not too chewy). There was then a 20 minute wait for the beef to be brought out and in the mean time we ordered another round of beers. This is about the point they dropped the ball on service. Five minutes after ordering our second round of beers we were asked by another waitress if we wanted more drinks, to which we responded that we had already ordered. Another 10 minutes went by and still no beers, so I flagged down someone (politely) and asked if we could have our drinks. She kind of mumbled something and then went off towards the bar and came back with our beers five minutes later just as our ‘main meal’ arrived. The reason I put ‘main meal’ in inverted commas is that it looked absolutely huge….for an infant! I couldn’t believe that this was the same meal I received a size warning about. Maybe my hunger from the lack of a decent lunch (carrot sticks and a small tin of tuna) was affecting my eye sight and it was in fact big, but after finishing it I was definitely still hungry. Erroneous size warning aside, the dish was amazing! The beef was cooked really well and the gravy like sauce was ridiculously good. I would almost certainly order it again, If I wasn’t hungry and felt like a lighter meal. Value wise I’m not too sure where I stand on the Greenhouse, is the food quality better than the average pub? By a country mile, but then again the servings are a lot smaller. I imagine some people wouldn’t mind paying a bit extra considering all the steps they have taken towards being fully sustainable and heavily reducing their impact on the environment. Going along that train of thought, maybe one of their waste reduction strategies is to make sure there are minimal leftovers by reducing serving sizes, who knows. Personally I don’t mind paying that little bit extra considering the environmental friendliness of the joint, but I imagine some would. We finished off the evening with a cocktail on the rooftop bar. The roof top is littered with recycled furniture and is bordered by huge plastic bins that are home to all sorts of herbs and vegetables which they use down in the kitchen. My only complaint about the rooftop bar is that it is understaffed, only one person behind the bar, which would be fine if they were pouring pre-mixed margarita slushies for 10 bucks a pop, however, each cocktail seems to be created with care (which is great but also time consuming). We both had Mojitos, even though they were not on the official cocktail list, and they were among the best I’ve ever had. The Greenhouse is a great place to take interstate or overseas guests for a meal and a drink or even for a light meal before an event in the city but I just can’t see it being a place you would frequent on a weekly basis. 8/10Andaluz Tapas Bar in Perth, WA (64m away)Central small bar with quality tapas and fantastic cocktails. 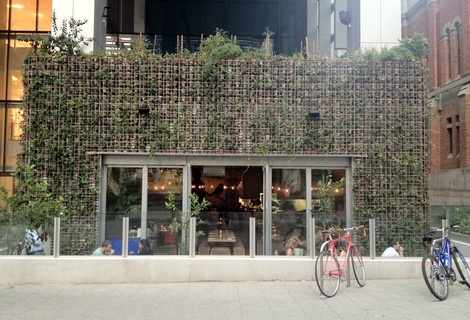 8/10Helvetica Bar in Perth, WA (73m away)Trendy little whisky bar tucked away between the office towers of Perth. 8/10Lalla Rookh Bar and Eating House in Perth, WA (98m away)Inconspicuous, modern inner city bar – outstanding food and great value.